After a long day at work, most people have trouble mustering up the energy to create a one-pot meal, let alone a rich spread of international favorites. I’m a little different; lately after leaving the office I have mastered pierogi, squid ink pasta, paella, lamb curry, and borscht, just to name a few. My nightly routine involves cracking eggs, making pasta dough by hand, cleaning fish and shrimp, grinding meat, stirring, frying, and chopping. A tear is never shed while slicing an onion, nor is my cutting board marred by beet juice stains. How did I attain such culinary aptitude? Simple: I purchased the Wii video game Cooking Mama: Cook Off. Cooking Mama proves there is no realm of life the video game industry won’t enter. This virtual venture into the kitchen is made possible by the interactive capabilities of Nintendo’s latest gaming system, the Wii, which allows players to direct game play through manipulation of the Wiimote (the Wii’s remote control) in addition to traditional button pressing. While in the Wii sports games you use the Wiimote as a substitute for a tennis racquet or a baseball bat, in Cooking Mama it can act as a butcher knife, a meat grinder, a skillet handle, a can opener, or a multitude of other utensils. The animation of Cooking Mama has a lighthearted tone and the soundtrack is catchy. “Mama” hosts the game, helping you learn skills through a variety of practice modes. Beginners have access to a limited number of recipes. By successfully completing a number of mini games that represent steps necessary to make the chosen dish within “Make It!” mode, you unlock more meals. Mama has a vast collection of recipes to share, as she teaches you how to prepare various foods from England, Japan, Italy, France, Germany, Spain, Russia, India, China, and the United States. By beating Mama’s international friends in contests, you receive golden cooking utensils. Consolation prizes are awarded just for challenging them-these help you to decorate your electronic kitchen. As you cook, Mama provides feedback with witty phrases ranging from “Wonderful! Better than Mama,” to “Eww, not nice.” Once you have mastered a recipe, you can play in “Challenge!” mode, where all the mini-games associated with that dish are played in quick succession, without taking a break between steps as in “Make It!” mode. Chop-the chef points the Wiimote at the screen, tracing the arrows to cut vegetables, fruits, and meats in the designated places. Cracking eggs-the Wiimote is held vertically and then swung to the left to hit the virtual egg against the side of a bowl. The egg must also be broken open by pressing a button after the egg has moved over the mouth of the bowl. Stir-using the virtual whisk, on-screen ingredients are stirred together by spinning the Wiimote in a circular motion. Knead the dough-the cook begins by pointing the Wiimote at the screen and then moves it in the direction of the arrows on the screen. Stew-this mini-game requires players to accomplish a series of tasks by following a guide that scrolls along the bottom of the screen. In this mode, players add ingredients to a pot while continually stirring and adjusting the temperature of the burner. The game highlights an interesting aspect of cooking: While each region may have its own distinct flavors, the methods used to produce these classic dishes are the same across the globe. Recognition of this factor may convince players to experiment more in their true kitchen, as once you’ve mastered chopping, stirring, and sauteing, there isn’t a type of cuisine you can’t prepare-especially since most of us will choose to leave meat grinding to a professional. While the game might convince some players to try new regional cuisines, it also exacerbates a few stereotypes. Some are more discreet than others. For example, the Italian friend is pictured with his soccer ball, the British friend is dressed somewhat like a Spice Girl, and the Russian friend appears gruff and heavyset. The international recipes seem an attempt to represent the range of foods within each country. The recipes that represent the U.S., however, depict a country lacking sophistication and cooking ability. During my game, I have thus far made four “American” foods: popcorn, hamburgers, hot dogs, and shortcake. I admit these are commonly consumed by Americans, but they don’t at all represent the range of American flavors. Perhaps the makers wanted to depict only American foods lacking influences from other cultures? In doing so, the game isn’t representing U.S. cuisine-where is the Cajun cooking of the Deep South, or the spice of the American Southwest, or the chowder made famous by our coastal cities? 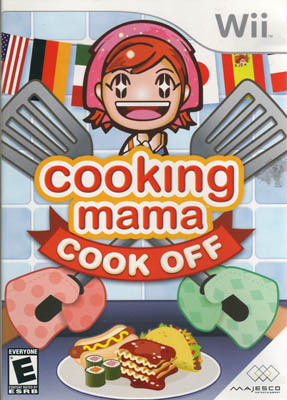 Instead of representing the variety within the U.S., Cooking Mama portrays American food as fried and sugared. Reviews have called Cooking Mama mildly entertaining to boring. These reviewers are likely not members of the target audience. Clearly, this game is not intended for the ultimate video game-player extraordinaire, nor was the plot or interface developed by Miyamoto. Rather, Cooking Mama is meant to attract a new set of gamers: perhaps the mom who wants to play with the expensive toy she purchased over the holidays for her kids or someone like me who just isn’t interested in playing endless loops of Halo. If you have never played a game on the Wii console, this could be a fun starter, as it teaches you the fundamentals of the Wiimote while giving you a basic overview of international cuisine. A word of warning: Despite the fact that you cannot smell your creations, you will nonetheless become hungry while playing.